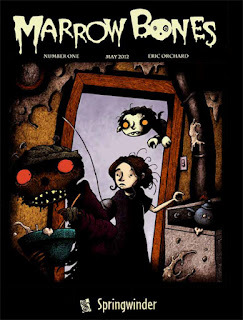 Dr. Gangrene's Mad Blog: Interview with MARROWBONES creator Eric Orchard! Marrowbones is a fairy tale for children of all ages. The monsters are loveable and cuddly and sometimes spooky. 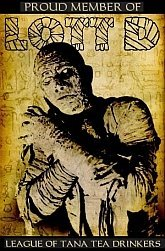 The first comic features everything from vampires, humans, werewolves, and ghosts to more whimsical creatures such as a Kitchen Lich and Dough Zombies. 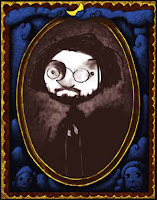 The art is charming and slightly reminiscent of Edward Gorey. 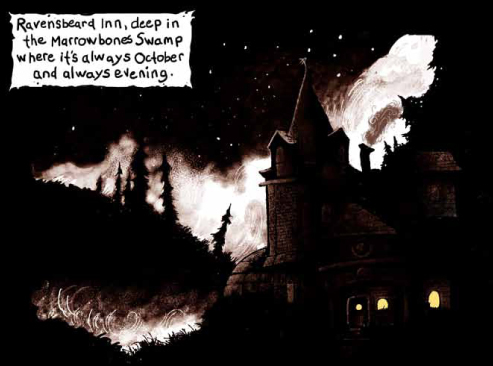 The world of Marrowbones Swamp is a place of childlike wonder in a dark horror wrapping. It was written and illustrated by Eric and is available digitally at his website: www.ericorchard.blogspot.com for just $2.00 (47 page book). Hi Eric – thanks so much for doing this interview. I really enjoyed Marrowbones. For the readers out there, describe the comic briefly, if you would. 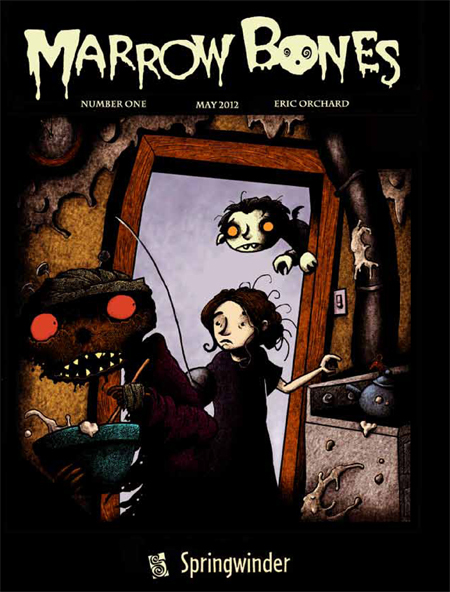 Marrowbones is the story of Nora, a young girl who doesn't fit into the world. Rejected by her family because she can see ghosts and monsters she is finally rescued by her Uncle Barnaby and ends up working for him at his inn in the haunted world of Marrowbones. I've always read fantasy and horror and in my mind they're all kind of mixed up. 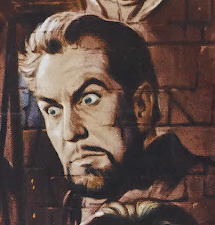 Like Christopher Lee I consider horror to be a kind of fantasy. From very early on I was reading huge amounts of Stephen King, Clive Barker, Tolkien and his imitators, fairy tales, ghost stories, Weird Tales pulp, EC horror comics, Tintin, books illustrated by Arthur Rackham and Edward Gorey and all these things became all mixed up to me, I didn't really categorize them too much. It all filtered through my imagination as something new. Something fantastical and horrific, ha! So, yes, I've always been a horror fan. It's an incredible rich tradition and I'm always finding something new and compelling. What was the inspiration behind Marrowbones? I understand it was a story that had been rattling around in your head for sometime…? I was travelling around Quebec with my family. There was a huge thunderstorm and we were looking for a hotel in a place called Riviere Du Loup. Riviere Du Loup means Wolf River and I couldn't help but imagine the hotel would be run by werewolfs. It was while my wife was driving in the car that I drew Uncle Barnaby for the first time. All of the sudden I had the perfect framework for years and years of supernatural stories I had wanted to tell. I continued to develop it over the summer (last summer) and this spring I finally got around to doing the first issue. This is the first digital comic you’ve done. What was your general impression of working digitally vs. on paper? I've been experimenting with digital for a very long time but it was only recently that I started seeing work by other cartoonists that I felt was as interesting as traditional work and was compelled to start seriously using digital as a means of storytelling. I switched from constant experimenting to seriously using it as a storytelling/drawing tool. My general impression is that it's like drawing on magical glass. Ha! It's a funny medium and it takes some getting used to. I mainly did Marrowbones on my Cintiq which is created for artists and designs to give them a very natural drawing experience. And that's what it is. I've decided recently that when working digitally, at this point, the hardware is more important than the software. You used Manga Studio and Photoshop primarily to create this, I understand. Is the finished work high res enough that it could be printed out if you ever wanted to, and do you ever foresee that as a possibility or will it remain a digital download? Everything I do has print in mind. I think it's the most optimal way to read comics. I did Marrowbones in very large, print ready files and I'd love to see a book some day. This digital launch was a lot of work, so I feel I can only think a little ways ahead on different formats. One thing that has to be nice about doing an all-digital comic is the lack of a middle man, specifically Diamond Distributions, who I feel is playing a huge role in killing the comics industry (but that’s a rant for another day). The internet is really a powerful tool and a great equalizer for the small publisher, allowing a global delivery instantaneously! Do you see this becoming an increasingly popular decision for comic creators as a way of getting work out there? Yeah, I'm not consciously trying to sidestep any middleman in particular, it more has to do with being impatient to have more work out there. Traditional publishing works very slowly, and publishers are only able to do so many print books a year. I'm not talking about monthly floppy comics but the graphic novel market. I have no real experience with the floppy market except as a consumer. What I can say for sure is that digital self publishing is an incredibly exciting, fun way to work. You get a sense of community, a lot of fresh challenges and new paths to explore. It's amazing. I love it. My feeling is that the comics market should be comprised of individual creators selling work directly to fans as well as larger publisher supporting and assisting in larger publishing ventures. I put Kickstarter in the first category. I'm not sure what diamond's place should be in this emerging market but I do sense that direct market stores need to shift away from monthly floppy comics to slightly higher end products like nice collections, toys, shirts and other merchandise. I'm not sure the direct market should be attempting to compete with the digital market, but maybe it should be treated as a separate entity and that they mutually support each other’s products. I’ve followed you on Twitter for some time now but just recently discovered your blog. 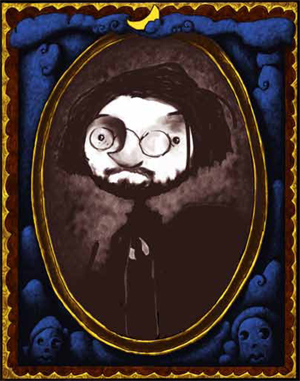 It is interesting following the creation of Marrowbones as you developed it. I think the reader interaction is a good thing as well. Is that important to you? I love it but I think it's a tricky thing. The biggest risk is getting the sense that your project is complete before you start it because you're getting feedback on fragments of an unfinished thing. Ive read warnings from creators about sharing too much before you're ready. Stephen King talks about this in On Writing. I think there's something to that. 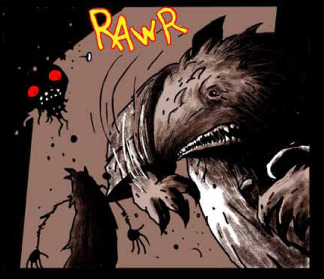 I actually reserved most of Marrowbones issue one before releasing it and I'd never done that before. I found it helpful to sit with the work itself for a while before releasing it. At the same time I don't entirely agree with the sentiment that you shouldn't share stuff before releasing it. I think you need a balance. The sense if community and shared journey you get through blogging about a project has become an essential part of the way I work. I like to think of it as leaving the studio open a creak and letting some of the weirdness leak out. I think that's healthy and fun and I plan to keep working that way. I found one post on your blog really interesting: "Another thing is I did it fast. It's a 47 page comic done in about a month. That's pretty fast. But I think it looks as good as anything I've done. I've been talking a lot about developing a strong, fast style. And I feel like I did this here." Working quickly and firmly is really important, in my opinion. So many artists, myself included, work and rework and pick at drawings trying to make them perfect and end up destroy any energy in the work, leaving it lifeless. Talk about the challenge of working quickly, and is this struggle, of fighting perfectionism, something that you ever fight with? The only real struggle is in the regrets I feel after its released. That's a terrible feeling. Knowing I could've done a drawing better. Have you read The Art of Maurice Sendak? In an interview he talks about the importance of establishing different styles. This kind of goes against the generally accepted wisdom that a cartoonist or illustrator should develop one look, almost as a sort of branding tool. But what Sendak says makes a lot of sense to me, it's about story telling. You need to have a full set of tools to appropriately tell different kinds of stories. That's my philosophy on my faster, simpler work: it suits the story so it has to be done that way. Some mainstream cartoonists get flack for being able to draw in different styles and it drives me nuts. I see it as an asset. One thing I found interesting is the fact that your lead character in both this comic and your other current work, Maddy Kettle, (a comic published from Top Shelf comics), is a young girl. Do you feel particularly drawn to female protagonists in your stories, and how does that affect your storytelling? I think that comes down mainly to my personal experience. I was raised by a single mother, and in retrospect raising me seems heroic, ha! So, it just has to do with the women in my life. Also, it's probably a bit of an influence from Hayao Miyazaki, who creates amazing female heroes. 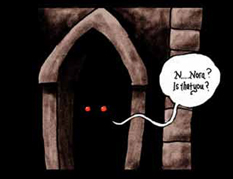 What does the future hold for Nora and Marrowbones swamp? Are there more adventures in store for her and the haunted hotel? I really want to do more stories in Marrowbones. I've been carrying around these stores as long as I can remember and I feel a real need to tell them. I've penned the next few issues. But self publishing is tricky, I need to do it while still working on contracts. About Eric Orchard: I'm an illustrator and cartoonist living in Toronto. I got my start in publishing doing picture books but I've been publishing fantasy and horror mini comics since high school. Comics were always my goal. I've done work for Tor, Top shelf, Scholastic, First Second, ONI and others. I've won the Spectrum silver award for comics and I've appeared in the annual exhibit of the Society Of Illustrators. "Drawing on magical glass." HA! I like that.